item_display_length و رنگ را از بالا انتخاب و سپس بر روی افزودن به سبد خرید کلیک نمایید. ♥SPARKLE CUBIC ZIRCONIA - Featuring a halo with some smaller cubic zirconia (CZ) and a round 7mm cubic zirconia in four prong basket. These dazzling design not only reveals brilliant shine and a meticulous cut like real diamond, but also lights up the look of your beauty. Great for women, girls and man. ♥HIGH QUALITY MATERIAL - Made from high quality brass, along with a layer of rose gold plated on its surface. 925 sterling silver posts protect you from an allergy or skin irritation and allow you to wear them every day. Nickel free and lead free guaranteed. 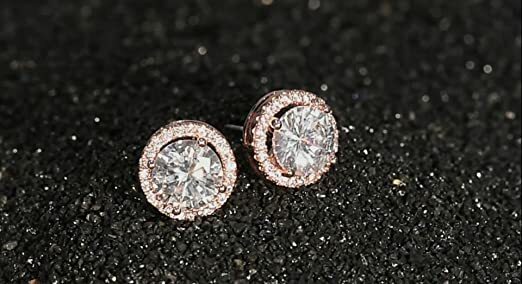 ♥DETAILED EARRING INFORMATION - Classic four prong design makes cubic zirconia more stable and less likely to come off. Earring Size:0.39inch(Length)/0.39inch(Width);Post Length: 12mm/0.16 inch. We committed to provide you the highest standard materials and craftsmanship. ♥BUY WITH RISK FREE – One Year Money Back Guarantee in case you are not satisfied . The exquisite jewelry gives you a totally fresh impression. Fleur Rouge is best for your jewelry collection.